SOLON, OHIO, February 28, 2019 — Tarkett, a worldwide leader in innovative and sustainable flooring and sports surface solutions, announces the launch of Offset and Balance from designer Suzanne Tick. 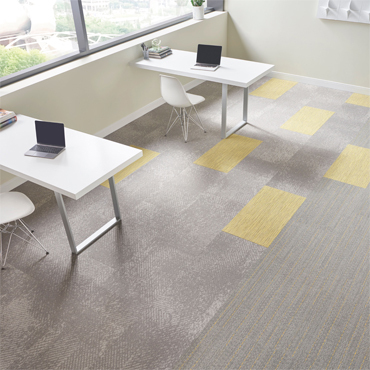 Ideal for the workplace, K-12 schools, university and healthcare spaces, Offset and Balance is a soft surface collection that is available in a Modular tile platform. Inspired by the unfinished and exposed raw materials used for industrial printing techniques, Offset and Balance create a casual sophistication that doesn’t feel heavily designed. Both styles create the illusion of having a fuller texture, and provide outstanding performance with permanent stain resistant properties. With an agile approach to design and the convenience of QuickShip, these two styles work together to bring industrial resourcefulness to any project. 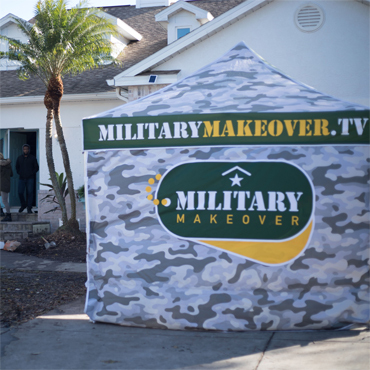 “More and more, we are seeing the repurposing of unused or underutilized suburban spaces. These serve multi-faceted functions, marrying their original structures and materials with updated ideals. Offset and Balance reflect that translation of industrial material to innovative function by nodding to practical techniques and rendering elegance,” states designer Suzanne Tick, Tick Studio. Offset is a non-directional, organic pattern that comes and goes with an almost pixelated effect, giving the impression of a transferred design. Balance builds on this idea by adding a random stitch detail to provide more direction and a playful accent. The concise color palette includes seven warm and cool neutrals as well as a deep navy blue. Balance is highlighted by colorful accents including a true red, bold blue, and primary yellow, useful for identity representation across spaces. Balance and Offset offer broad design possibilities, whether used independently or in conjunction with one another. 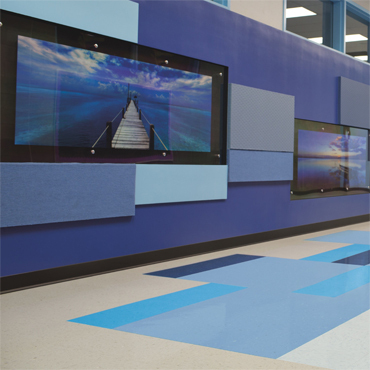 At Tarkett, we believe in placing people in the center of every space. So we’ve developed the Tarkett Solution SPECtrum™, a portfolio of products designed to work together both functionally and aesthetically, helping you create more productive workspaces that maximize return on investment. Our full palette of colors, patterns, and textures is coordinated to work together visually across platforms. So the endless balance of function, safety, and longevity is always done on budget, in style, sustainably. 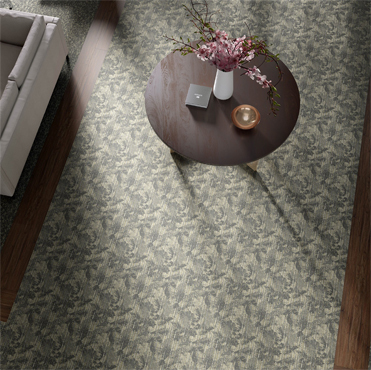 Tarkett believes that together, we can make a positive impact on people and the planet. That’s why we’re Doing Good—Together, connecting our sustainability efforts with what our customers value and our world needs. It’s an active, living commitment to create a future where people and the planet prosper in balance. Where sustainable flooring solutions don’t just perform, they inspire. As part of Tarkett’s sustainability commitment, Offset and Balance are available on ethos® Modular with Omnicoat Technology™, a Living Product Challenge Imperative certified backing made with PVB film from recycled windshields. The two styles also include Eco-Ensure™ soil protection technology, a fluorine-free chemistry that is Cradle to Cradle Gold Material Health certified. More information about all of Tarkett’s products can be found at www.tarkettna.com. With a history stretching back 135 years, Tarkett is a worldwide leader in innovative flooring and sports surface solutions, with net sales of more than €2.8 billion in 2018. Offering a wide range of products including vinyl, linoleum, rubber, carpet, wood and laminate flooring, artificial turf and athletics tracks, the Group serves customers in over 100 countries across the globe. Tarkett has 13,000 employees and 35 industrial sites, and sells 1.3 million square meters of flooring every day, for hospitals, schools, housing, hotels, offices, stores and sports fields. Committed to “Doing Good. Together.”, the Group has implemented an eco-innovation strategy based on Cradle to Cradle® principles and promotes circular economy, with the ultimate goal of contributing to people’s health and wellbeing, and preserving natural capital. Tarkett is listed on Euronext Paris (compartment A, ISIN: FR0004188670, ticker: TKTT) and is a constituent of the SBF 120 and CAC Mid 60 indexes. www.tarkett.com.